I hereby consent to the use of the personal information provided above. Member name and phone numbers may be listed in the website membership directory. Names and images of members may also be used in all forms of media. Names, demographics and member status may be provided to parent provincial and/or national curling associations. Email will be used to regularly communicate; emergency contacts only used as necessary in the event of an emergency. STEP 1: Select the membership type first (the round checkbox). STEP 2: Then select league(s) (the square checkboxes). STEP 3: Enter all team member names (if known) under Convenor Notes; each team member must submit their own form. "Intro to Curling" 6-week program: Oct 22 - Nov 28, Monday or Wednesday options 6:30 pm. Designed for new players, all ages and genders. $80 include all instruction and gear. Participants only need clean footwear & stretch clothing. The 6-week "Advanced Skills" Winter Season - mid January to mid-March, Mon/Wed options, 6:30pm. ($100 incl. membership). Min 6 sessions total. A combo event - specific skill-based training and mini-games each night. Suitable to curlers wanting to increase their skills, those returning from a long absence or those wanting to try the game w/o a full season commitment. Doubles and Dinner - averages twice monthly, 12 nights in total - ($80 per season not incl membership or meals). Enjoy it as a couple, father/son, mother/daughter or any other combo; a night out with a great meal and great friends! You RSVP the dinner once/month; league members save on each meal. Mixed Doubles rules but any gender is acceptable. Tentative schedule includes Oct 12 & 19, Nov 9, 16 & 30, Dec 14, Jan 4 & 18, Feb 1 & 8, Mar1 & 8. Elementary - Thursdays from 3:30 to 4:45pm. $30 all-inclusive. This is the Dawson Creek & Area Elementary School League. Organized by convenors through each elementary school. Grades 7 or younger. Usually 3 youths and an older mentor at lead. Season runs November to mid February. Junior Club - Mondays @ 4:30pm. Junior League. A club league with instruction. Players must be under 21, although most are between 11 and 16 years old. Suggested minimum age is 8. Commercial League - Mondays @ 7:00pm. Open format - any gender mix. Super League - Mondays @ 7:00pm. More competitive, open to any ages/genders. Regular dues apply, plus teams contribute ($1000) to the prize pool. Payouts per win. Seniors - Tuesdays @ 1:00pm and Thursdays @ 10:00am. Drop-in format, teams selected at start of each session. A great mixer. Mixed League - Tuesdays, 7:00pm. Traditional mixed curling league with alternating genders at 3rd and skip. All ages/skills. Ladies League - Wednesdays @ 6:45pm. Traditional ladies league, all ages/skills. Mens League - Thursdays @ 7:00. Traditional mens league, all ages/skills. Could be two draws/nightly or occasional overflow to another weeknight if numbers warrant it. Social Member ($50) - no ice privileges. If this is a renewal membership, has your contact details changed from the previous year's registration? Certifying true and accurate information. 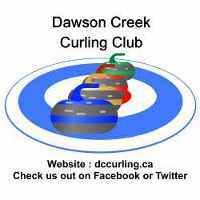 I also understand that the Dawson Creek Curling Club is a member owned and operated club. I understand that in order to keep our rates at a minimum it is required of every member to volunteer in some capacity. I make that commitment and have completed an associated knowledge, skills and abilities assessment (KSA). If my KSA was previously submitted, I certify its validity. If I am not paid in full at the time of this registration, I will forward the amount owing to Dawson Creek Curling Club, PO Box 178, Dawson Creek, BC V1G 4G3 on or before deadline. Cheques may be post dated to November 6, 2018. My membership entry and the associated cheque must be received by the club no later than November 6, 2018. If my registration and/or cheque has not been received by Nov 6, 2018, a $50.00 late fee will be applied. To arrange alternate payment arrangement, if necessary, I will contact dccurl@shaw.ca or 250-782-4080.